This week's opening of the American Ballet Theater's Othello at the Metropolitan Opera House, a spectacular version of Shakespeare's tragedy about the warrior king who succumbs to the manipulations of an ensign, and murders the love of his life, marks ABT's commitment to newer works. As part of its 75th anniversary, ABT had been showing the early works of George Balanchine, Agnes DeMille, Jerome Robbins, among others, but with this Othello, first produced in 1997, with Lar Lubovitch's choreography and Elliot Goldenthal's music, the ballet in three acts verges more toward opera than to traditional ballet. And with Julie Kent, Marcelo Gomes, and Misty Copeland, ballet superstars, the work was thrilling. For the Academy Award-winning composer, this is a highpoint in a stellar career scoring movies, and other works in many genres. Most recently, he created sound for Grounded, a one-woman show starring Anne Hathaway, and directed by Julie Taymor at the Public Theater. 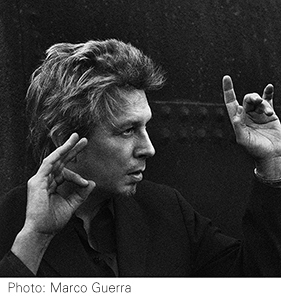 I had the opportunity to talk to Elliot Goldenthal prior to this opening, about his work on Othello and Grounded, his Symphony in G Minor, the upcoming film release of A Midsummer Night's Dream, and the career honors he is about to be awarded in Poland. The eerie and technical music for Grounded, and the Othello ballet seem to come from opposite sides of a musical sensibility. What were some of the challenges of creating music for these works? Elliot: One is supporting a performance: for Grounded, a show that Julie Taymor directed, the music alludes to a specific language of music. I call it a soundscape: the music allows the actor to sit in an environment that caters to emotion. For Othello, the music takes on the practical needs of composing by reaction to Shakespeare's narrative; every detail is specifically related to the event of Lar Lubovitch's grand ballet. Another variation, the Othello Symphony, is the pared down version. I took the 2½ hour event of the ballet music, and rarefied that to 32 minutes, not to tell the story narratively as ballet does, but to turn narrative ballet into a symphony. What will audiences see at the Metropolitan Opera House? Elliot: Othello is the only 3-act commissioned ballet and the most successful American ballet in the last 25 years, remounted in New York, Chicago, and parts of Europe, with 70-80 musicians, it is a giant grand ballet. The MET opera house fills 2300 seats every night. Symphony in G Minor seems more experimental, a slow building movement that suddenly goes wild. What was your inspiration? Elliot: Symphony in G Minor is a personal work. I was creating an atmosphere of experiencing time in a different way. The first movement is slow, using delicate instruments. It's like reading a Proust novel, a psychologically gripping 13 minutes. In the second movement, all hell breaks loose. The percussion section surrounds the audience, and flies in and out of spaces. I would think it longer travelling in time, while the shorter movement seems longer than it is. It had its European premiere in Austria in September. You have often collaborated with Julie Taymor. Is there some short hand that you have working together? Elliot: Working with Julie seems like short hand. But in the end, work is trial and error. You try to find your way, shift strategies. She is one of my continual collaborators. Neil Jordan is another. We did Michael Collins, and other movies. I did 6 or 7 with Julie, plus 13 stage productions. We have a lot more to go. We worked on A Midsummer Night's Dream for the opening of the Theater for a New Audience. The film of that will premiere on June 15 in New York. Tell me about the award you are about to receive in Poland. Elliot: I am the first composer to receive this national award, the first honoring composer Wojciech Kilar. He did the score for Roman Polanski's The Pianist and Francis Ford Coppola's Dracula. He was born in 1932 did opera and film scores during occupied Soviet Poland. The award is for composers who are wedded to the classical style, and work directly with the director or the writer, concerned with artistic vision in a personal way. Kristof Penderecki and Roman Polanski were the judges. The award ceremony will take place in Poland, May 25-26, followed by a concert of my Shakespeare compositions in Krakow, May 28 and 29. That will include music from Titus Andronicus, The Tempest, A Midsummer Night's Dream, Othello excerpts, a giant Shakespeare concert with the orchestra joined by rock musicians playing amplified sound. Grounded is about to close, on May 24. Are there plans to move it to Broadway? Elliot: We are not sure. It is a very practical show, not much of a crew, with few costume considerations. Anne Hathaway takes it on all the demands of this role. Her concentration is fierce as a pilot who is working the "chairforce," disappointed she is not in the blue. Her tears are real; she is that connected. It was hard for me too. I had to compose it at night, to show different sides of her personality as it changes every night, as opposed to film where you have captured it, and that's the performance. Theater is living art.